The elegant city of Bath is a great place for a romantic weekend break, or for soaking up history and literature. 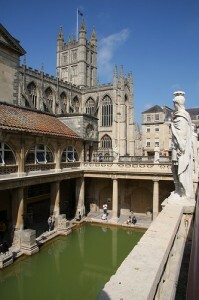 I’ve lived there, I’ve worked there and still Bath remains one of my favourite places in England. I can only imagine the glee on the faces of the Romans, shivering in England’s mists and wondering why they’d left their warm country behind, when they discovered Bath’s springs at a soothing 46 C.
Today you can walk around (but sadly not bathe in) the spring baths, overlooked by Roman columns and statues, and the extravagant Pump Rooms, a fashionable place for lunch. Watch out for the ‘opportunity’ to taste some real spring water, though. Looks spectacular, tastes disgusting. Right next door to the Baths, this Abbey overlooks a square that often entertains buskers. Look out for the stone angels climbing up the side of the building. Chandeliers hang above these former dancing rooms, where Charles Dickens and Jane Austen would while away their evenings (though not together, of course). Entry is free, although you do need to pay to visit the Fashion Museum downstairs. For free, you can walk from Pulteney Bridge and its charming riverside, to the impressive Georgian Circus and on to the Royal Crescent with its view across the Avon Valley. Bath certainly has plenty of luxury boutique hotels and restaurants but you can also find budget accommodation right in the city centre. You can walk to each of Bath’s highlights. Travel by train if you can, since the roads around Bath are very congested and parking is expensive and difficult. If you travel by train, you can get a 2 for 1 deal on many of the attractions listed here. Bath – one of my favourite places for a cheap weekend break.